The 123-two bedroom villas at Marriott's Royal Palms Villas provide luxury accommodation for families seeking the best for their Central Florida vacation. The complex is one of Marriotts Vacation Club timeshare projects. Each of the non-smoking villas is capable of accommodating six people in comfort and the property is adjacent to the Orlando World Center Marriott Resort and Convention Center. The center is home to a full-treatment spa, the Hawks Landing Golf Club and numerous restaurants and lounges. 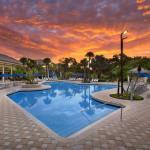 The property is a short drive from Walt Disney World with its myriad of attractions. Downtown Orlando and the other central Florida theme parks and shopping centers are within easy driving distance. Wireless Internet access is available in all the villas and in most of the public areas of the complex. The two-bedroom, two bathroom villas have a screened balcony or patio and come with a separate living and dining area, breakfast bar and full kitchen. The master suite has a king-size bed, oversized bathtub with spray jets and separate shower. The televisions have cable movie and news channels and pay-per-per view movies. Other amenities include an in-room safe, iron and ironing board, alarm clock, DVD player, washer and dryer, pullout sofa bed and hairdryers. The villas have an outdoor swimming pool, childrens pool, whirlpool and fitness center. The Hawks Landing Steakhouse and Grille, in the nearby Marriott Orlando World Center Resort, is open for breakfast, lunch and dinner. There are other restaurants and lounges in neighboring Marriott properties. There is a coin-operated laundry on-site, games room, barber and beauty salon, and a picnic area with a barbecue grill. Other amenities include a gift shop and newsstand, concierge desk, an ATM and valet dry-cleaning.